Schlock-Wire: Full Specs For Scream Factory’s ESCAPE FROM NEW YORK Collector’s Edition Blu-Ray – Schlockmania! 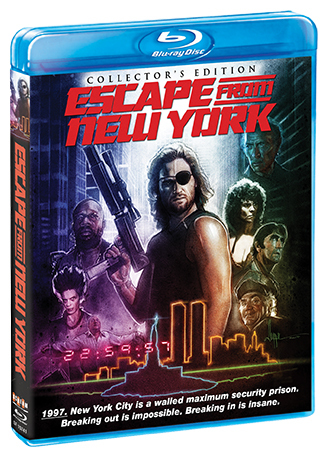 Los Angeles, CA – Scream Factory has announced the April 21, 2015 release of John Carpenter’s Escape From New York (Collector’s Edition) on Blu-ray. The new edition of the 1981 cult classic starring Kurt Russell, Lee Van Cleef, Ernest Borgnine, Donald Pleasence, Isaac Hayes, Season Hubley, Harry Dean Stanton, and Adrienne Barbeau includes several bonus features including a new 2K scan of the inter-positive, struck from the original negative. In a world ravaged by crime, the entire island of Manhattan has been converted into a walled prison where brutal prisoners roam. But when the US president (Pleasence) crash-lands inside, only one man can bring him back: notorious outlaw and former Special Forces war hero Snake Plissken (Russell). But time is short. In 24 hours, an explosive device implanted in his neck will end Snake’s mission – and his life – unless he succeeds!